Myanmar (previously known as Burma) is located in South East Asia. A coup in 1962 resulted in Myanmar being governed by a military dictatorship for many years that resulted in Myanmar becoming one of the world’s most impoverished countries. While the economic situation has improved since the military relinquished control in 2012, a large portion of the economy is still controlled by supporters of the former military government meaning the gap between the rich and poor is widening. DMI planted the first church for the deaf in this strongly Buddhist country in 1999. We currently have two churches meeting regularly for worship, teaching and fellowship. In 2004, DMI opened the Immanuel School for the Deaf, which is one of only three schools for the deaf in Myanmar. In 2015 the school changed its name to the Muir School for the Deaf which, in addition to honoring Neville Muir, the founder of DMI, also means “happy place” in Burmese. 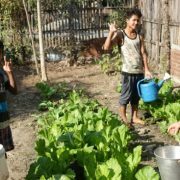 The school currently has 32 students, most coming from the remote villages in the surrounding Chin Hills and staying in the school’s dormitory during school terms. The students learn animal husbandry skills at the school’s piggery, which also provides a source of income for the school. The school syllabus and exams are set by the local government hearing school, and our children are achieving very good results even compared with the hearing children. They are so happy to go to a school and have deaf friends. These students live a very simple life and their Christmas celebration is usually a fishing trip. The school has a board of local people who contribute to decision making for the school. There are many deaf adults in this area who have never been to school. 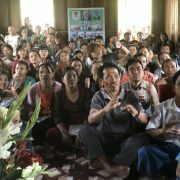 So, signing classes have been started for them in a village where the deaf people had no knowledge of Myanmar Sign Language. One of our teachers who is deaf himself travels by motorbike to the village each weekend and teaches signing, good health, nutrition and child care. They have learned to sign and are becoming a deaf community that can communicate with each other. 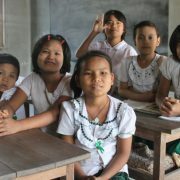 A rice field has been purchased to help finance this school in the future.